MANILA, Philippines – Former college football superstar and Heisman trophy winner, Tim Tebow has finally found a new home with Philadelphia Eagles. The Eagles will sign the wide-bodied Quarterback on Monday, April 20, 2015 (Tuesday, April 21 Manila Time). Tim Tebow whose Parents were American Christian Missionaries to the Philippines was born in Makati Medical Center on August 14, 1987. Drafted 25th overall by Denver Broncos in 2010, Tebow lead his Team to 2011 NFL playoffs but was quickly eliminated by the Pittsburgh Steelers on the first round. During the 2012 offseason, Denver Broncos signed veteran and top caliber Quarterback, Peyton Manning and sent the young Tebow to New York Jets as Mark Sanchez’s back-up. By the end of the season, the Jets decided to part ways with Tim. The New England Patriots signed Tim Tebow during the 2013 – 2014 Preseason. But after spending 12 weeks and playing for all of Patriot’s preseason games, he was cut and did not make the 53-man official roster mandated by the NFL. He remained free agent for more than a year after his last NFL tenure with the Patriots. He joined Good Morning America as a contributor for a new series called: “Motivate Me Monday”. Tim also became a part-time Football Analyst at ESPN. It was also reported that several teams from Canadian Football League (CFL) expressed their intentions to sign-up and some of them offered starting roles to the free agent but he remained hopeful for another NFL shot and declined the offers. Tim Tebow began working out Coach Chip Kelly and the Philadelphia Eagles early this March for a potential comeback. Sunday night (Monday morning Manila Time) when the news broke out that the Eagles management will finally ink Tebow for a $6 Million – 3 year contract deal. Tebow’s journey with the Eagles will not be smooth sailing. He will battle it out for Quarterback positioning along with former St. Louis Rams top choice QB Sam Bradford and ex-New York Jets starting Passer Mark Sanchez whom he backed-up in 2012. As of today, Tebow is Eagles’ fourth-string Quarterback and have to make the official 53-man roster before the 2015 season starts in September to assure his NFL comeback and career revival. 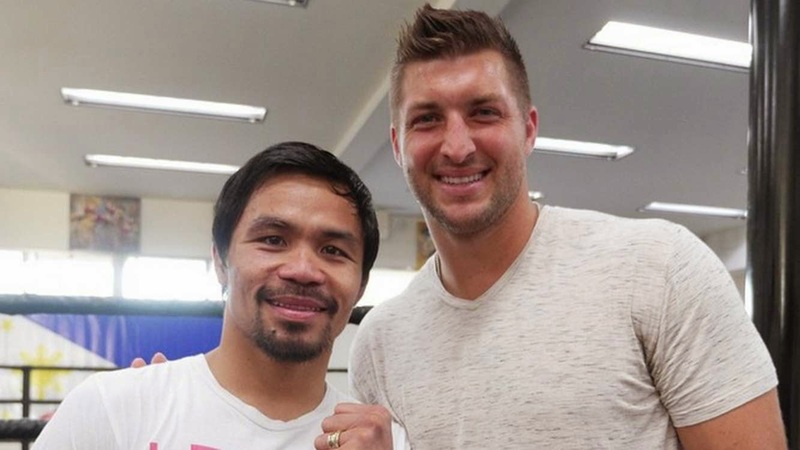 Couple of weeks before the contract, Tim Tebow paid visit to his “kababayan” and brother-in- Christ Manny Pacquiao in support for the latter’s fight of the century against the undefeated American Boxer, Floyd “Money” Mayweather Jr. on May 2 (May 3 in Manila, Philippines). Without any Filipino blood running in his veins, Tim Tebow is a true Filipino by heart and regarded Philippines as his second home. He might not be an NFL superstar and did not have a multi-million dollar in his pocket from his Football stint, but he was still able to build a hospital in Davao City, the Tebow CURE Hospital which provides life-changing surgeries to Filipino children with curable diseases. D’ Waterboy and The Summit Express wish Tebow the best of Luck!